The centre of contemporary Paris and the site of such landmarks as the Louvre and of the Tuileries and Palais-Royal, the 1st Arrondissement  is full of attractions for travellers of all inclinations, including some of the finest parks, museums, shops, and bars in the city. The 1st occupies the Right Bank of the River Seine and extends onto the western section of the Île de la Cité in the midst of the river. For occupying such a compact space, however the 1st feels remarkably different from one end to the other. The almost incredibly upscale western end of the arrondissement gives way to the hustle and bustle of the big city east of the Palais Royal, and then further east to the pedestrian (and tourist) dominated area around Les Halles and the (currently shuttered) Samaritaine, where tourists mix with (especially young) Parisiens and Parisiennes in huge numbers (on the order of 800,000 unique visitors per day according to the Mayor's office). Paris was historically centred on the Ile de la cité, but by the time Baron Hausmann was given the task of carving up the city, the centre had shifted somewhat to the previously suburban Royal Quarter surrounding the Louvre and the Palais Royal. Travellers arriving at one of the airports will probably get in via the RER-B line at the formidable Métro station Châtelet/Les Halles, read on for details. Châtelet/Les Halles, the hub for the 1 and D lines is the largest and busiest of all Métro stations. There exists a total of seven entrances/exits scattered around the eastern end of the 1st Arrondissement, concentrated (not surprisingly) between Les Halles and Place du Châtelet, and also accessing the basement of the Les Halles shopping mall itself. If you are in a hurry—or have never used this station previously—it might be better to alight one Métro stop earlier or later. Of course, if you are transferring to or traveling on one of the RER lines, brace yourself. Châtelet/Les Halles is a French equivalent for New York City's Grand Central Station. 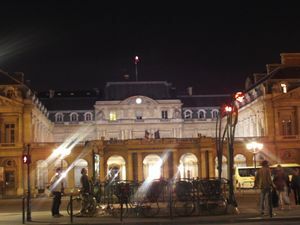 Line 1 line crosses travels the length of the arrondissement, arriving from Chateau de Vincennes in the east via Gare de Lyon, and La Défense in the west. Most of the stations are fairly easy to use with the exception of Châtelet/Les-Halles. If you have a choice go for Palais-Royal/Musée-du-Louvre, Hôtel-de-ville or Tuileries. Line 14 line is the newest metro line, and probably the best way to arrive from Gare de Lyon, and thus from Switzerland or the South of France since it is a fully automated express train. Think of it as a sort of a horizontal elevator. It stops at Châtelet/Les-Halles and Pyramides. Line 7 cuts diagonally across from the northwest to the southeast or the other way depending on how you look at it. Entering from the southwest (perhaps Gare d Austerlitz) you'll want to get off at Pont Neuf. Line 4 runs north and south through the east end of the arrondissement, mostly under Châtelet. Again, we prefer the Cité or Etienne-Marcel stops to the Châtelet madness. 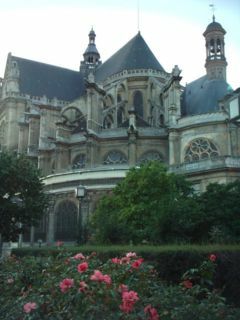 Having arrived in the 1st arrondissement walking will most likely suffice for transport. That said, Paris cabs are quite cheap. Still, even they don't have access to much of the carfree eastern end of the arrondissement. If traveling from east to west by Métro you are probably best off using any other stations than Châtelet/Les Halles unless you have to connect there. Although the Métro trains themselves are fast and frequent, the crowded labyrinth at Châtelet can make getting to the trains an adventure. Le Palais Royal, ☎ +33 1 45 20 82 56, . 7:00am to 11:00pm during the summer and 7:00am-8:30pm in the winter with hours varying in the spring and Autumn months. Ordered by Cardinal de Richelieu (1585-1642), King Louis XIIIth's prime Minister in 1629 (completed in 1636); originally called Palais Cardinal; it became Le Palais Royal when Anne d'Autriche, Louis XIIIth's wife, came to live here to get away from the Louvre palace. It eventually housed Louis the XIVth until the move to Versailles. It includes also a beautiful garden Les jardins du Palais Royal, enclosed within the buildings. It's been the theater of one of the seminal events of the French Revolution (Camille Desmoulins made a famous declaration here in 1789). The Théatre Français nearby was built in 1716. There are numerous restaurants inside the garden , including famous Le Grand Véfour. There's also the controversial Colonnes de Buren, striped columns installed within the inside yard among the XVIIth century architecture. edit These striped columns and column stumps are within the Ministry of Culture (those buildings surrounding it on three sides). La Conciergerie, (Métro: Cité), ☎ +33 1 53 73 78 50, . open daily 9.30am - 6.30pm April - September; daily 10 am - 5 pm October - March, entry €6.10, concessions and guided tours available, under-18s free - the ancient medieval fortress and prison of the city's island, site of some remarkable medieval royal architecture and the scene of Marie Antoinette's imprisonment in the period leading to her execution in 1793 - lots of Revolutionary associations. edit Don't miss the clock tower - seen from the street - which was recently cleaned (2013). It is the oldest clock tower in Paris. 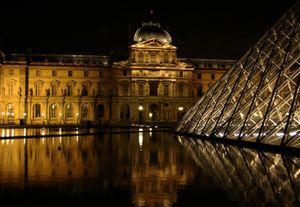 Musée du Louvre, Place du Carrousel (Métro: Louvre), ☎ +33 1 40 20 53 17, . open daily 10am-6pm, closed Tuesdays and some public holidays, evening openings We and Fr until 9.45pm, 1st Su of the month. Free admission for all, general admission (not including special exhibitions) adults € 12, EU-peoples under 26 years free, exhibitions in the Hall Napoléon € 13; combined ticket (museum + spezial exhibitions) adults € 16 Carte Musée. One of the great joys of a visit to Paris is to simply walk around and explore to get the feel of the city. 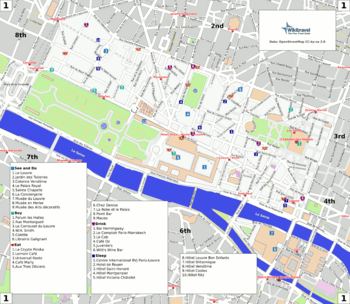 The 1st is as good a place to start as any, with the largely car-free section around Les Halles, and the right bank of the river Seine as good places to start. As a little bonus if you are in Paris in the summer time, the express lanes at river level are converted to an all pedestrian road called "Paris Plage" which fills with rollerbladers and sun-bathers just about every afternoon. A number of Paris theaters are located in the eastern end of the 1st. English language productions are not unheard of, but the opera is likely to be in Italian anyhow. Your best bet if you are interested in finding a show in either language is to pick up a copy of Pariscope which you can find at any newsstand for around €0.50. There are ticket outlets at Forum Les Halles (FNAC) among other locations. The 1st provides rather a wide range of eating possibilities, considering its central location and overall poshness. A large variety of inexpensive food is sold out of windows and stalls, especially on the car-free east end of the arrondissement near Les Halles. You'll always pay a bit more to sit down, of course. On the other hand if you are looking for a nice posh place to take your mom or a date there are plenty, and some of them actually have food that is good enough to be worth the considerable prices. Some of the most opulent hotels in the world are located either in or very close to the 1st arrondissement, and there's some choice in the mid-range. Budget travelers, on the other hand are probably better off in other, less central parts of town. Of course many hotels also offer wireless connectivity, but usually for a fee. This page was last edited on 24 March 2019, at 21:15.